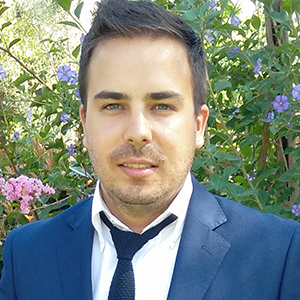 Filipe Alves is currently a research fellow in the Nanoelectronics Engineering Department (Nanodevices research group) at INL. His research is focused on the development of integrated inter-ocular eye pressure monitoring systems, based on MEMS pressure sensors. His research interests range from the design and modelling of MEMS sensors to the design of mixed-signal integrated circuits. He obtained his PhD in the microelectronics research area, focusing on pull-in based MEMS inclinometers with integrated electronics at the University of Minho. Filipe has been a scientific visitor at the Delft University of Technology and at INL. Before joining INL he was an assistant professor at the Industrial Electronics Department of the University of Minho. Alves, F. S., Dias, R. A., Cabral, J. M., Gaspar, J., & Rocha, L. A. (2014). High-Resolution MEMS Inclinometer Based on Pull-In Voltage. Journal of Microelectromechanical Systems, 24(4), 931-939. Dias, R. A., Alves, F. S., Costa, M., Fonseca, H., Cabral, J., Gaspar, J., & Rocha, L. A. (2015). Real-Time Operation and Characterization of a High-Performance Time-Based Accelerometer. Journal of Microelectromechanical Systems, 24(6), 1703-1711. Brito, N., Ferreira, C., Alves, F., Cabral, J., Gaspar, J., Monteiro, J., & Rocha, L. (2016). Digital platform for wafer-level MEMS testing and characterization using electrical response. Esteves Moreira, E., Lima, V., Serra Alves, F., Cabral, J., Gaspar, J., & Rocha, L. A. (2016). Full-gap tracking system for parallel plate electrostatic actuators using closed-loop control. Sensors and Actuators, A: Physical, 244,174-183. Alves, F. S., Dias, R. A., Cabral, J., Gaspar, J., & Rocha, L. A. (2013). and Microsystems, TRANSDUCERS/EUROSENSORS 2013, (June),928-931.